The K-Line K-22521C Kennecott Copper Corp. MP-15 Diesel Engine from 1997. This 1:48 scale engine is version # 1 made exclusively for KCC members in 1997. It features dual motors, transformer controlled Forward - Reverse and headlight, plastic trucks and metal wheels, axles and handrails. This is the Powered and Dummy F-7 Great Northern A-A Locomotive Set from Williams by Bachmann. This is the Powered and Dummy FA-1 Great Northern A-A Locomotive Set (#267A & #276B) from Williams by Bachmann. FA-1 Great Northern powered unit features: - Powered by 2 maintenance-free can motors with precision flywheels - True Blast II digital horn and bell - Patented 6amp electronic reverse board - Operating headlight - Operating die-cast front coupler - Die-cast trucks, trucksides, fuel tank and pilots - All metal wheels and gears FA-1 Great Northern dummy unit features: - Operating headlight - Operating die-cast front coupler - Die-cast trucks, trucksides, fuel tank and pilots - All metal wheels. 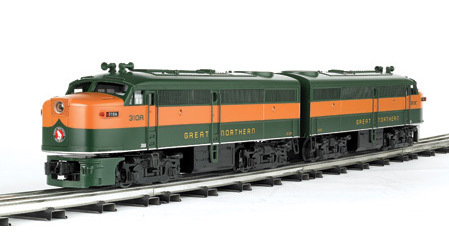 This is the Great Northern SD-45 Powered Locomotive (#419) from Williams by Bachmann. This is the O Gauge SD-45 Great Northern from MTH.